Prachtige 4 slaapkamer huis in een rustige buurt met prive zwembad. Minder dan 30 minuten van Zion National Park en 15 minuten van St George. Slechts enkele minuten van Sand Hollow en Quail Creek en op loopafstand van Grocery Store, restaurants, fast food, banken en buurtwinkels. Huis is omgeven door prachtige schaduw van de bomen, waar u bij het zwembad kunt zitten en te ontspannen na een dag wandelen en te verkennen. Volledig ingerichte keuken met potten, pannen, borden en alles wat je nodig hebt om te koken. 3 Vernieuwde badkamers. Dit huis heeft alles wat je nodig hebt om uw huis weg van huis. Kom en geniet van ons huis als thuisbasis terwijl je Zion en Southern Utah te verkennen. We loved our stay at this cute house! The house is located on a quiet street which we loved & was super clean! I’d definitely recommend a stay here ! We are counting down the days until we can do it again! The weather was just getting warm for the year, so we couldn’t use the pool. But the house was wonderful. It was clean and beautifully decorated. It was close to Zion National Park. We hiked Angels Landing. The house made us want to buy one in the area. The property was very clean, well maintained and comfortable. Excellent value for money. Highly recommend it if you want to be close to Zion and want to avoid the overcrowded and overpriced options in Springdale. The home was great!! Will stay again I the future. This is a wonderful property for a trip in the Southern area of Utah !! We went to Zion national park, we hiked more remote canyons, and we did a paddle board excursion in the nearby region. There is a lot to do in this region. Lastly the owners and property managers were a pleasure to work with. 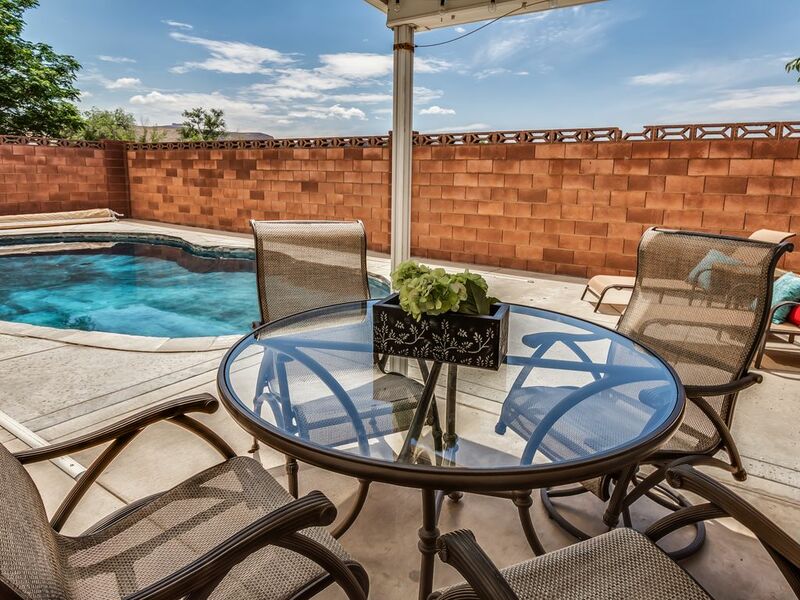 Clean and large home featuring a pool, grill, garage with opener and air conditioning. Kitchen was fully stocked making meals for our family of seven affordable. Used the crock pot twice while we were there. Short 30 minute drive to Zion and 2.5 hour drive to Bryce. I asked for advice on horseback trail rides and the recommendation for Canyon Rides at Bryce Canyon resulted in the best lifetime experience for our family to date. We really enjoyed swimming in the pool when we were around the house. Walmart is pretty close also. Took in a movie at the local theater also. Not a lot of room in the kitchen but that wasn’t a big issue. Went to the Quail Creek State Park one day and rented a paddle board. They also had kayaks, water mats, etc. for rent. Would definitely stay here again if in the area. Thank you for your feedback Tammy. You and your group were fantastic guest's. You were great to communicate with and took wonderful care of everything. We would love to have you back. House is blokken van winkels, banken, restaurants en alles wat u nodig heeft en toch zijn geen huizen achter het. Zeer rustige familie buurt. De perfecte combinatie van de nabijheid van voorzieningen en landelijke omgeving. Rates are subject to change until booking is confirmed. PLEASE NOTE: DURING WINTER MONTHS IF YOU WANT POOL HEATED THERE WILL BE AN ADDITIONAL CHARGE. PLEASE CONTACT OWNER FOR DETAILS AND RATES.